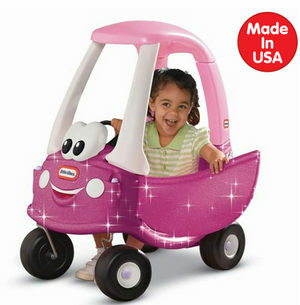 A comprehensive directory of toys made in USA. Since 2007. Americans seek to avoid foreign made toys for safety and patriotic reasons, but finding toys made in America in retail toy stores can be difficult and time consuming. 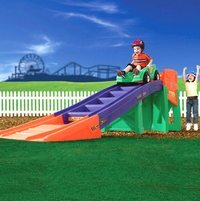 Toysmadeinamerica.com finds quality toys made in the U.S. for you so you can save time and shop online. 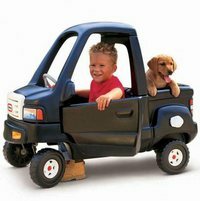 Browse these pages and you will find American made toys, pet toys, games, gift ideas, and U.S. toy companies. 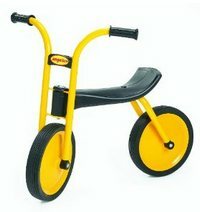 Kids can learn their balance and learn to ride a two wheeler on this smooth and sleek pedal free balance bike. Rugged welded steel frame with spokeless wheels on 2″ wide rubber tires. 5 year warranty, no assembly needed. Made in USA. Classic Scooter styling with a welded steel frame and steel wheels with solid rubber tires. Scratch and rust resistant powder coated paint. Heavy duty handgrips, low maintenance nylon bushings. Lifetime service and replacement parts. 5 year warranty. Good for kids 4 – 8 years. Made in USA. 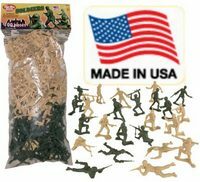 50 green and 50 tan toy army men made right here in the United States. Riflemen, bazooka men, flame throwers, bayonet men, and more. 2″ tall high quality plastic. Just like the ones when you were a kid. Made in America. 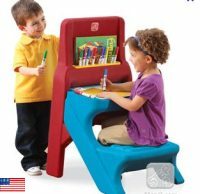 This kids art easel desk is two creative activity centers in one. One side has a little art desk with a wipe off white board to color, draw, or paint. It has storage for markers and coloring books. The other side has a stand up art easel with a white board and a paper holder to create artistic masterpieces. USA. 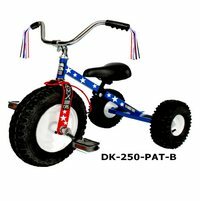 Durable and long lasting all-American kids tricycle. 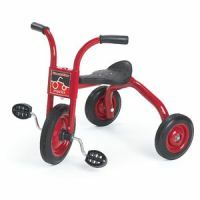 Angeles kids trikes are made of quality steel to last years under the toughest conditions. Many more models such as scooters, wagons, chariots and more. USA. Lots of companies have headed to China to lower costs on skateboards. Gravity Skateboards are still made in USA. Longboards and retro skateboards. 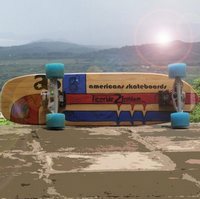 Decks, trucks, and wheels all made in America. 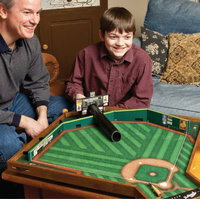 Ultimate home baseball game. Hit the ball through the outfield fence for singles, doubles, triples. Smack it over the fence for a home run. For the family room, man cave or game room. Play alone or in teams. Made in America. 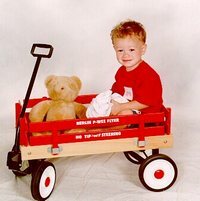 Best quality, longest lasting, durable wagons for kids. Not in major retail stores. A small, family-run business. Kids wooden wagons designed to last generations. Proudly made in the U.S.A.
A classic toy. Kids love to organize and hammer the colored pegs. Made of kiln dried hardwoods, non-toxic paints and built to last. 8 pegs, 4 sizes. 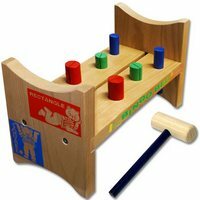 Kids can hammer and hammer, and then flip it over and hammer them back! Made in USA. Gravity fed 2 Lane race car tracks for small die cast cars like Hot Wheels or Matchbox cars. 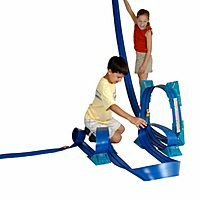 Similar to the classic Hot Wheels race tracks, but two lanes instead of one (most parts made in USA, check site for more info). 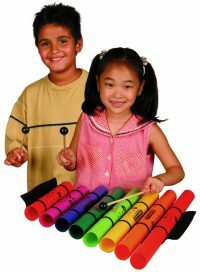 BoomWhackers are award winning tuned percussion tubes for instant musical fun. Just whack the labeled and color coded tubes along to the songbook to play songs. Inluded tubes are middle C, D, E, F, G, A, B, and Treble C. Boomwhackers are a great way for children to learn to play music without much help. Includes tubes, mallets, tube holder, songbook and instructions. “World’s Finest Children’s Microscope” Made in America. The Brock Magiscope is available in 20x, 40x, 50x, 100x, 200x and 400x objectives with a 10x eyepiece. High quality, kid friendly and nearly indestructible. Excellent for classroom or field use. #1 in science and nature centers. 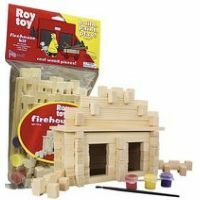 Kids can design and build their own firehouse from all natural pine wood. Wood pieces are sanded and ready for painting. 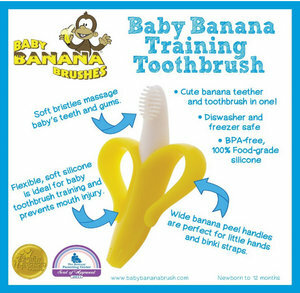 Comes with paint brush and non-toxic paint. Just the right size for the little hotwheel and matchbox sized vehicles and army men. Made in USA. 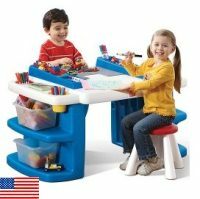 This multi-purpose activity table gives kids a place to create, build and draw. Molded in storage areas, bins, cups and removable trays. Compatible with Lego and Mega Bloks. Includes table, stool, cups, storage bins and trays. Easy wipe and clean plastic surfaces. 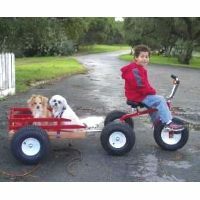 Large trike suitable for kids and adults Heavy duty, very stable, difficult to tip over. Rated up top a 750lb load. Made in California. 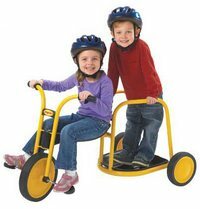 This fun kids tricycle chariot promotes strength, balance, healthy play and cooperation. Sturdy welded steel frame, steel wheels and solid tires for rugged durability and low maintenance. Easy one bolt assembly. 5 year warranty. An early education learning toy. Features embossed alphabet, animal pictures, and numbers. High quality, won’t splinter, chip or crack. Non toxic colors. 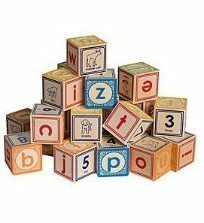 Helps with learning ABC order, uppercase letters, numbers, sounds and fine motor skills. Made in USA. 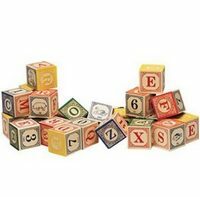 Lowercase letters, numbers and baby animals on these made in America of Michigan basswood blocks. Large size makes these ideal for stacking. Non toxic colors. 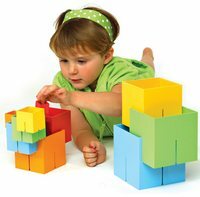 Solid wooden blocks, fun colors, large, durable, and educational fun. Hop in, load up the toys and let’s haul stuff! This ride on toy truck has a real working door, gas cap, truck bed with a drop down tailgate and realistic front grill. Rugged wheels work indoors or out. Ages 2 – 5. Made in USA. It’s time to climb, slide, crawl, peek, hide and seek. 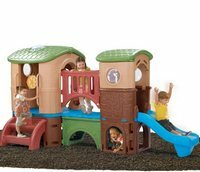 There’s a lookout tower, a bridge, two slides, a crawl space and skylights and a steering wheel. 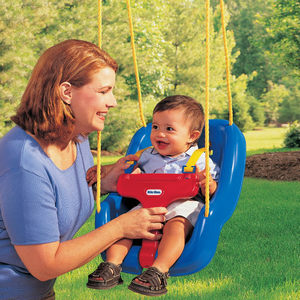 Hours and hours, and years and years of fun, healthy playtime activities. Made in USA. Crafted in the USA from New England pine and hardwoods. Non toxic finish. Good quality and durable. Has 2 removable passengers. Ages 2 – 5. Made in USA. 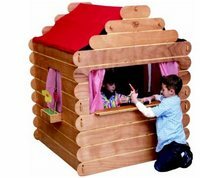 Sturdy all wood kids playhouse. Has a large front window so kids can pretend it’s a store, a diner, a puppet theater, and more. The roof and curtains are attached with velcro and the four interlocking walls are easily assembled by and adult. Kids playhouse is Made in USA. 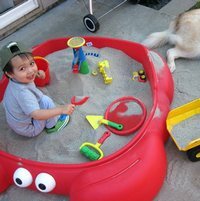 Kids sandbox fits 4 kids, has 2 crab claw seats, molded cover to keep bugs, weather, and pets out. Holds 300lbs of sand. About 4′ X 4′ space. Durable and weather resistant plastic. Hours of outdoor fun. Made in USA. 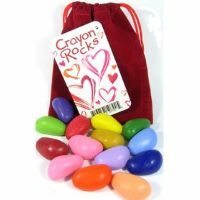 Crayon Rocks are made from all natural soy wax from soy beans grown in USA and colored from mineral pigments. Vibrant colors with a shape designed to strengthen gripping muscles. Great for developing fine motor skills. 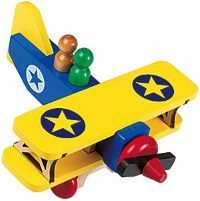 A wonderful educational building toy that inspires creativity and develops visual spatial learning. An engaging and entertaining learning toy that promotes inventiveness to create new structures like “houses” and “offices” and amazing architectural designs. USA made. Dirt King Tricycles are virtually indestructible. They are hand welded of heavy gauge steel. Dirt King comes with all terrain pneumatic tires mounted on heavy duty steel rims with ball-bearings. 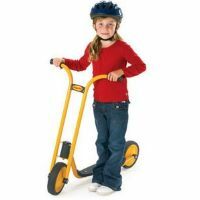 Adjustable seast and handle-bars will adjust to your youngster for years of healthy fun and exercise. It’s the on and off-road tricycle your kids will pass-on to their kids! 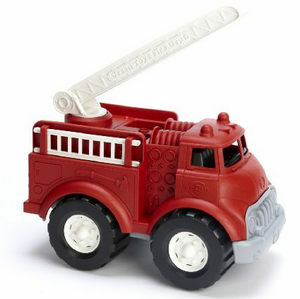 This eco friendly toy dump truck is made of 100% recycled plastic milk bottles. 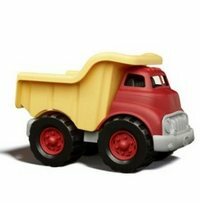 Roomy tilting dump truck bed, super sturdy construction. Just the right size for young hands. Made in USA. Give a child a readily accessible place to create, draw, sketch, paint, and visually explore ideas. 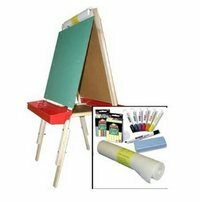 This adjustable double sided kids easel has a chalkboard on one side and a white wipe off marker board on the other. 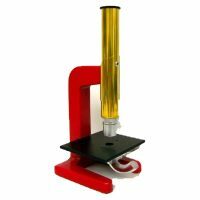 Comes with a top mounted paper roll, paper, markers and dustless chalk. Made in USA. A roller coaster at your house? Yes and one that will not only give the kids safe thrills rolling downhill, but plenty of healthy exercise as they push the car up the ramp over and over again. 30″ high platform, 9′ of track. Rugged double wall construction for safety. Made in USA.